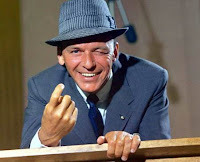 TBT: Frank Sinatra, "September Song." Yes, it's that month of cooling temperatures. We had a couple of days this week that saw thermometers registering in the low 90s, but relief is said to be on the way, after some rain we could use. It's also, for me and I suspect for many, a time of reflection, especially as we grow older and see the progress of the year reflecting our own progress into autumn, with winter to follow. "September Song" was written by Kurt Weill, with lyrics by Maxwell Anderson, for an unsuccessful 1938 Broadway show, Knickerbocker Holiday. It was first recorded by the show's star, Walter Huston. Despite the show's failure, the song went on to become a standard. Bing Crosby recorded it twice, and Frank Sinatra three times. The third was the lucky one; it was on his 1965 album September of My Years, recorded when he was fifty. The album went to number five on the Billboard pop album chart. The song was later covered by, among others, James Brown, Lou Reed, and Willie Nelson. Clothes in pop music, part 2, the Sixties. Just over a year ago, inspired by Moira Redmond's Clothes in Books, I posted "Clothes in pop music, part 1, 1955-63". Since my last post went to 1963, why am I calling this one, which goes into 1972, "the Sixties"? I don't believe "the Sixties" as we Americans understand the term in either cultural or political senses coincides with the decade beginning 12:00 a.m 1960 and ending 11:59 p.m. 1969. Some people, I think, would begin the Sixties with the election of John F. Kennedy (November 8, 1960), others with his assassination (November 22, 1963). Some other arguable starting points are Dwight D. Eisenhower's valedictory "Military-Industrial Complex" speech (January 17, 1961), The passage of the Civil Rights Act of 1964 (July 2, 1964) the Gulf of Tonkin incident (August 2, 1964), or--from a musical perspective--the first arrival of the Beatles in America (February 7, 1964). I've decided to go with the date of the assassination. While the election of JFK heralded a change, his assassination was an event that tore the fabric of the culture; one that, I think, would not be rivaled again until the Watergate scandal and resignation of Richard Nixon. As you can see above, several other transformative events came shortly afterward, in 1964. I'm not sure where to mark the beginning of the Sixties from a fashion perspective. Certainly Jackie Kennedy had an influence on women's couture, one aspect of which is mentioned in one of the songs below. For me, the most noticeable change came in the later Sixties, in the aftermath of the British Invasion, when Mod fashion began to make inroads here. What I remember are bright floral and paisley prints, wider lapels on men's jackets, and wider ties. Thanks to the Beach Boys, there was also a surfing influence, with baggies, Henley collared shirts, and huarache sandals. The other question is: When did the Sixties end? My answer is August 9, 1974, the date Richard Nixon resigned. Others, perhaps less politically and more musically oriented than me (though I think of myself as very musically oriented) might argue for the time the Beatles broke up, an agonizing, slow motion affair that may best be dated to April of 1970, when Paul McCartney announced he was leaving. Coincidentally, it was in the spring of 1970 that I experienced what I consider my quintessential Sixties moment. I was walking across the Cambridge, Massachusetts common and encountered five or six girls, about eight or nine years old, playing ring-around-the-rosie. What they were singing, though, was "Christ, you know it ain't easy/ You know how hard it can be/ The way things are going/ They're gonna CRUCIFY [all fall down] me." In 1964 Frankie Valli and the other Jersey Boys had a number one hit on the Billboard pop chart with "Rag Doll." According to the song's Wiki it was written by group member Bob Gaudio, who "was inspired by a dirty-faced girl who cleaned the windshield of his automobile for change." When Gaudio reached into his wallet for a dollar (a very generous tip in those days), he found he had nothing but twenties (evidently the singer-songwriter thing was working out well), and gave her one, to her amazement. "I'd change her sad rags into glad rags if I could" is for me one of the more memorable lines from the early, pre-British Invasion Sixties. Also in 1964, bluesman Tommy Tucker released "Hi-Heel Sneakers," which he wrote under his birth name Robert Higginbotham, misspelled "Higgenbotham" on the record label. 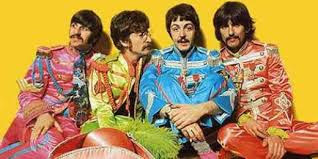 The song would be covered many times, including by the Beatles and the Stones. Yes, footwear counts. "Baby's in Black" was recorded in 1964, but released in 1965 as part of the album Beatles for Sale, which was released in the U.S. as Beatles 65. I've long been unsure if the song was about a woman mourning a deceased lover, or dressing in black to signal to an ex that she's available again. It's the former. As I recall, Jackie Kennedy popularized the pillbox hat. Bob Dylan had some fun with it in 1966, on this track from his album Blonde on Blonde. 1966 was a fertile year for songs about millinery and clothes. Mitch Ryder and the Detroit Wheels had a major hit with the pedal-to-the-metal rocker "Devil with a Blue Dress On." Footwear joins the fray in '66 with Nancy Sinatra's "These Boots Are Made For Walking." It was also a good year for tough woman songs (this and the one before). I was just saying you don't have to be anything; you decide what you want to be and you just walk down the street and if you're good the world will change as you walk past. I just wanted it to be the individual who created his own fashion. A very, I would say, Sixties sort of statement. Does eyewear count? I say, "Yes!" When I first heard "Judy in Disguise (with Glasses)" on Boston's WRKO in 1968, the DJ called the group "John Fred and his Louisiana Playboys." Jello Biafra covers the song on his recently released album of New Orleans R&B, Walk on Jindal's Splinters. BARE: Y'all watch Porter Wagoner? BARE: Yeah, I like him, too. But you know who his sponsor is? BARE: Yeah, well, I think I could do something like that. It'd go like this: Folks, this is the Bobby Bare Show, brought to you by Ex-Lax. Now we're gonna have some good old country pickin' and singin' and some old-time fiddlin', but first a word from our sponsor. Folks, you ever have one of those nasty old coughs, the kind that just hangs on and hangs on? Next time you get one of those coughs, take Ex-Lax. It won't cure your cough, but it'll make you too SCARED to cough. I'll close with a song by the Hollies, made long after Graham Nash left the group to join CSN&Y. The singer is Allan Clarke; unlike other Hollies songs there are no backing vocals because Clarke intended it for a solo album. It charted at number two in the U.S. in September of 1972, shortly before Richard Nixon was elected to his second term. This was followed by the revelation of the Watergate break-in and by the ensuing efforts to cover it up that would lead to Nixon's resignation two years later. In my previous post I promised that my next one would cover the time from 1963 to the present. I'll confess to having been unable to think of any pop songs after 1972 that are about or refer strongly to clothes. I suspect that this is because I haven't followed "pop" as much as I used to, and "pop" has fissioned into so many branches--disco, metal, punk, rap, reggae, indie, etc.--all of which I've followed to some extent, but none as thoroughly as the pre-seventies "top forty." If anyone can think of any songs from after 1972, or any from the period (1964-1972) covered in this post, that should be noted, please let me know. 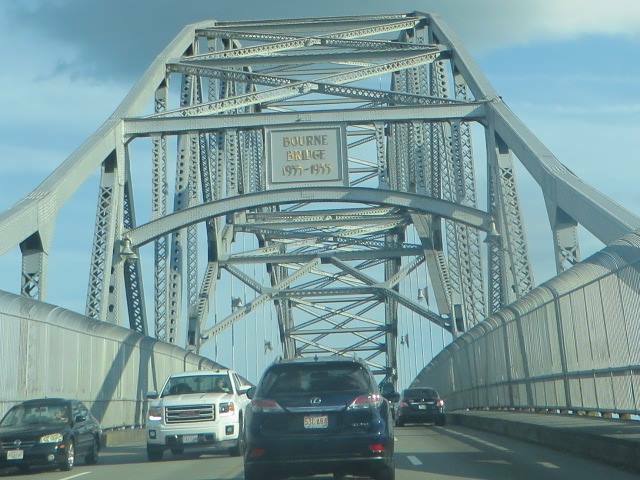 The Bourne Bridge, our entryway to the Cape. There are two other bridges that cross the Cape Cod Canal onto the Cape proper. To the north is the Sagamore Bridge, and to the south is a railroad bridge with a lift span that stays up to let ships pass and is only lowered when a train needs to cross. Rail passenger service to the Cape was restored recently after many years' absence. Skaket Beach, on the Cape Cod Bay side of the Town of Orleans, at high tide. Skaket Beach at low tide. Note how far out on the sandbars people go. Typical Cape marshland. What's that tower? Aha! It's an osprey nest platform, and an osprey has nested on it. Here's a close-up of the osprey. This rabbit was often seen near our friends' driveway. Looking back at Provincetown from the MacMillan Pier. The building in the background is the Provincetown Public Library. On the way back from Provincetown, we made our second visit to Truro Vineyards; a photo of their vineyard is above (compare to photos taken in early June of 2013 in the post linked above). I bought a bottle of their estate grown cabernet franc and one of their estate grown chardonnay. I'll be tasting both and reporting about them here; stay tuned. Here's a tiger swallowtail butterfly getting nectar from a butterfly bush in our friends' backyard.